The diversity of its people: more than 70 % of Chinese origin, around 15% of Malay origin and around 10% of Indian origin. 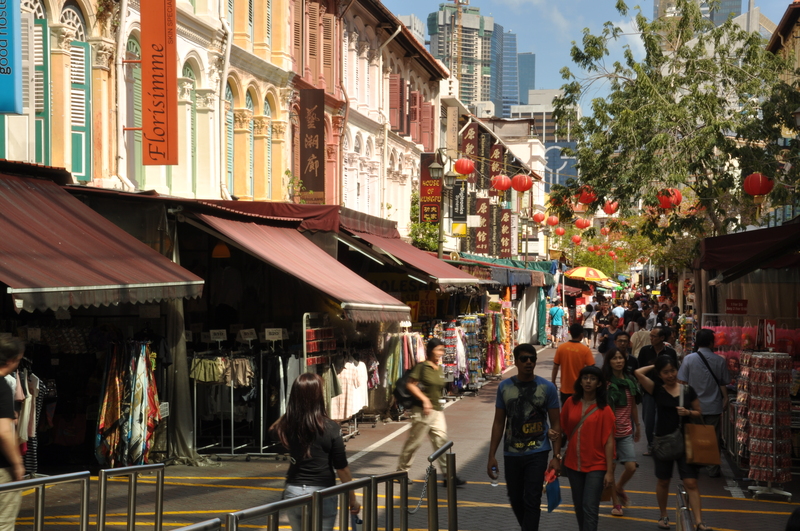 The different neighborhoods with different atmospheres (Chinatown, Little India, the Malay district…) – like many countries in one city! The delicious and diverse food and the love for the food that everybody seems to share! 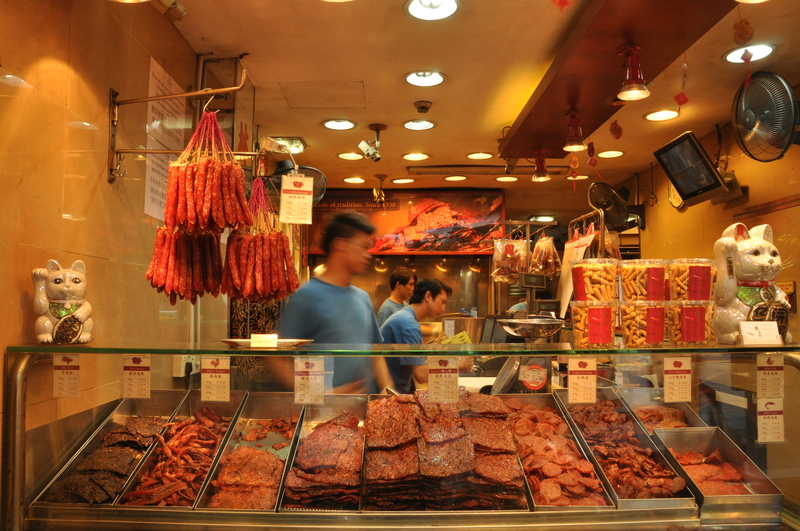 This kind of dry meat is a popular snack among the Chinese SIngaporeans. This shop in special is quite an institution of Chinatown! Great weather all year round – sunny, around 30 degrees Celsius, truly wonderful!!! Very strict and conservative laws – death penalty for drug dealers, criminalization of the male homosexuality, considering it a “gross indecency”, etc. 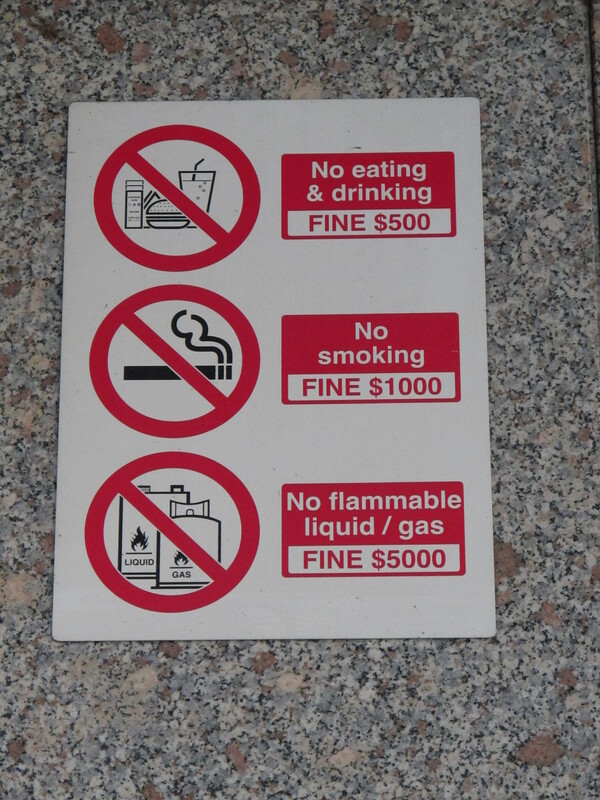 Many rules and fines for everything, including drinking plain water in the public transport! 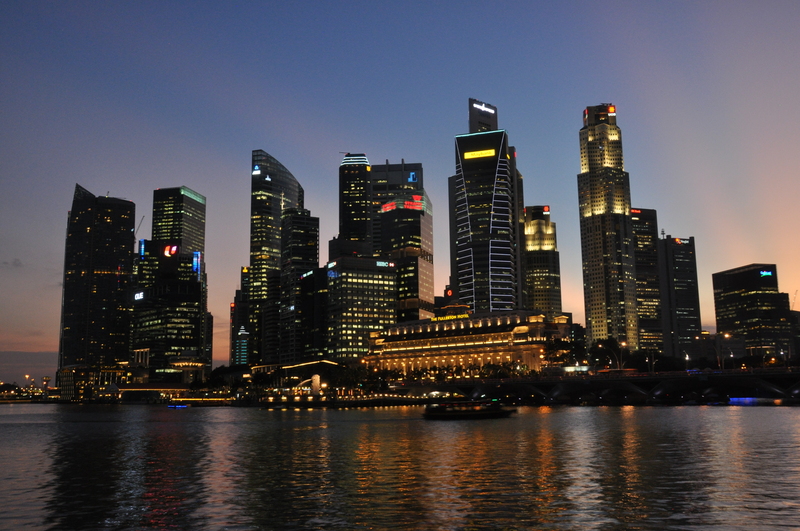 A broad smile will always appear in our faces when someone mentions Singapore to us. 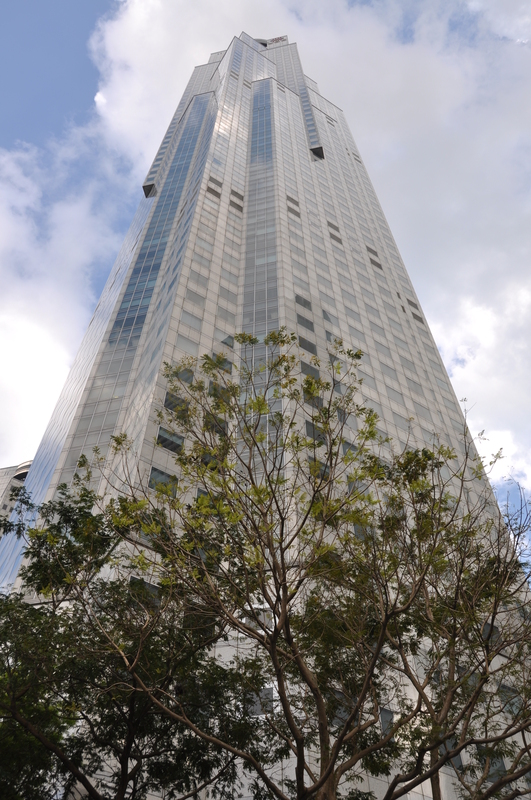 We spent four fantastic days there in February 2012, as a break between Myanmar and Indonesia. 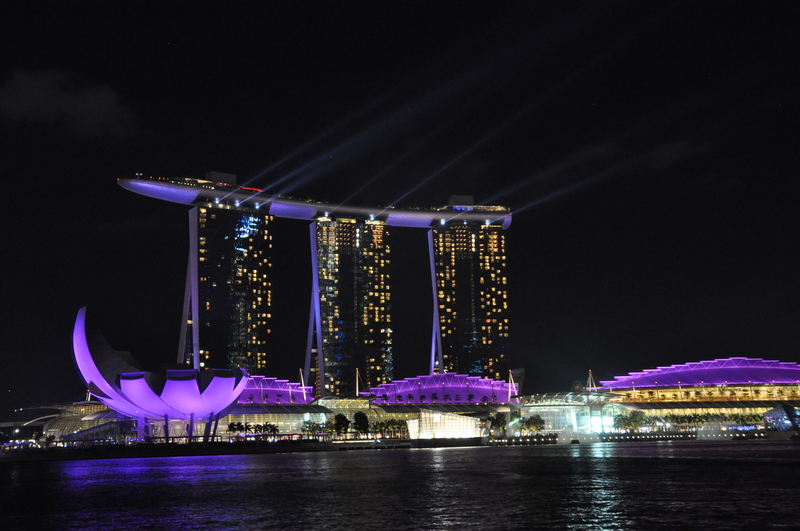 We do not say that Singapore isn’t special by itself, but in our case, what made our stay truly unforgettable was the wonderful Koh family. We met Glamis, the oldest son of the Koh family, a few months back in Copenhagen, when he and his friend Nicole stayed at our place for a couple of nights as a part of a “couchsurfing” experience. We immediately connected with Glamis and Nicole. They were extremely polite, friendly, generous, open minded…and so sweet! We had a wonderful time and we exchanged many experiences and stories with them. That’s why we came to think of Glamis when we travelled around in Asia. 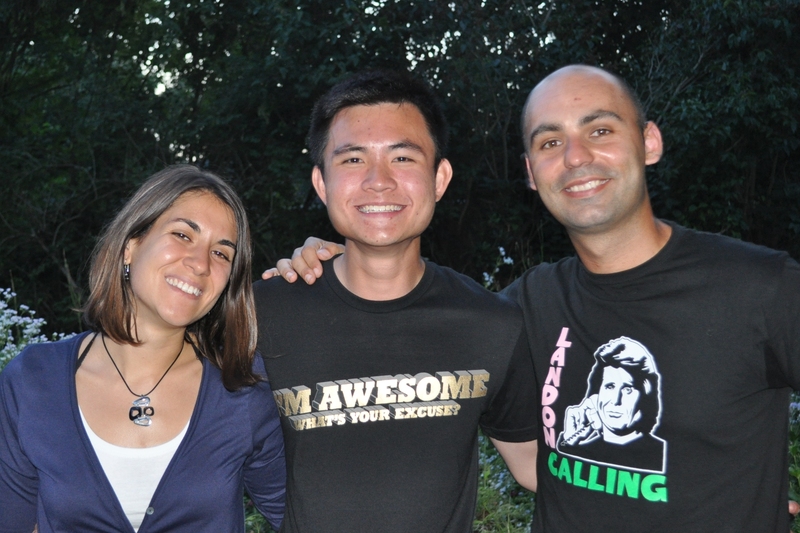 We would have loved to meet him again, but unfortunately, he is living in the USA as part of his training to become an astronaut, so he wasn’t in Singapore at the time of our visit. However, when we told him that we were going to Singapore, Glamis insisted on arranging everything in order to made it all possible for us to stay with his family even though he wasn’t there. When we arrived to the airport, Glamis father (Spencer), Glamis sister (Kelin) and Glamis cousin (Lucinda) were waiting for us with a home made poster welcoming us to Singapore! We were really touched with such a considerate and sweet welcome! After almost four months travelling around Asia by ourselves, we were positively surprise to find such a sweet family waiting for us at the airport! Since the moment they picked up us at the airport till the moment that we said goodbye to each other five days later, the Koh’s treated us as if we were part of the family. We really have no enough words to express how grateful we are to have met them. 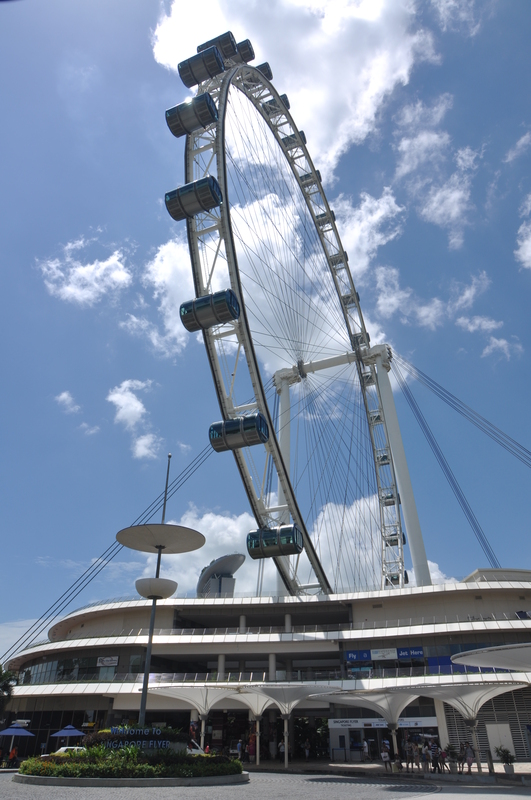 We hope that they will visit us in Spain or Denmark in order to pay their generosity, but for now we will try to pay tribute to them by writing this diary of our stay in Singapore. From the airport and before even going home, we all went to have one of the most typical Singaporean snacks: kaya toast and ice green tea. Kaya toasts pieces of toasted bread with kaya (coconut jam), sugar and butter on them. Truly delicious! 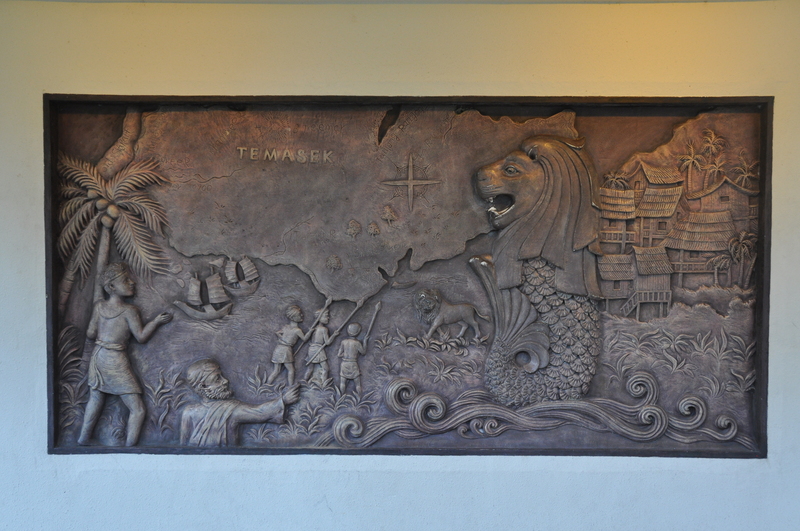 Then we headed for Mount Farber, a park located on a hill where we Spencer, Kelin and Lucinda told us Singapore history showed in stone murals around the park. 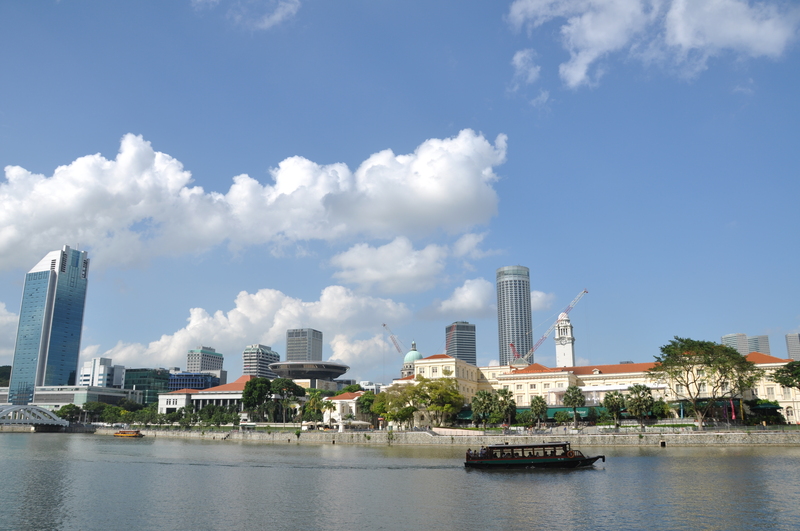 We also enjoyed panoramic views of the city and the busy Singapore harbour from this viewpoint. 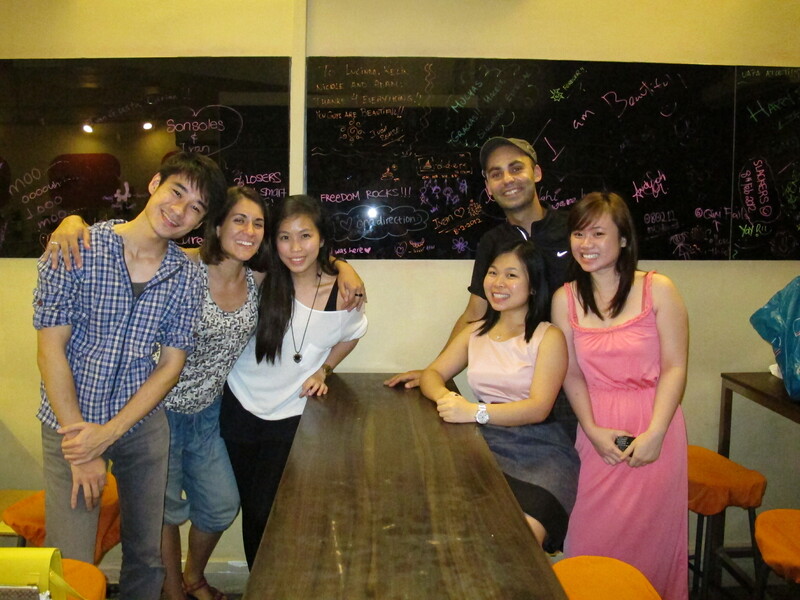 We met Nicole and Adam (another friend of Glamis and Nicole) for dinner at a local Chinese restaurant. We were really happy to meet Nicole again after her short visit to Copenhagen! 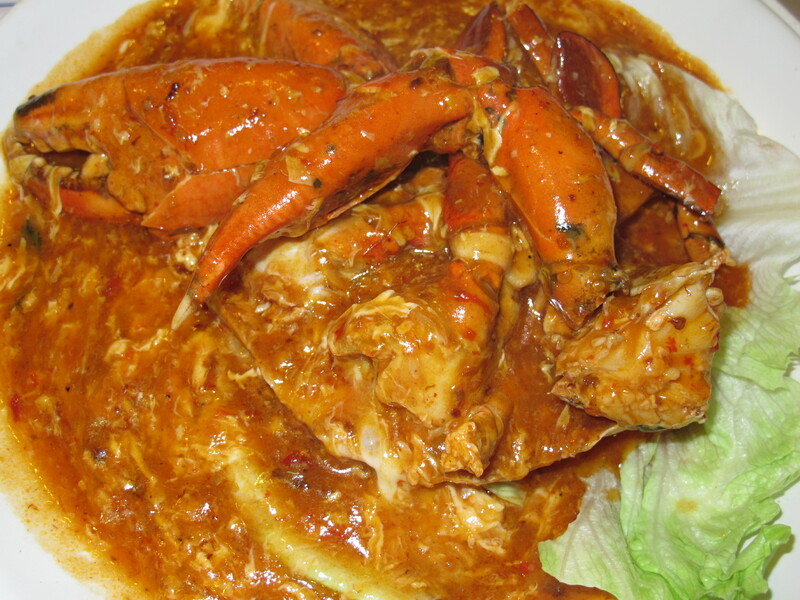 In the restaurant, Spencer ordered a lot of delicious Singaporean dishes such as the famous chilly crab. After the oily stews and the food poisoning that we had experienced in Myanmar we were truly happy to get something so tasty and delicious! After dinner, we were quite tired, but our hosts insisted on going for a walk around Singapore’s city and they were quite right: discovering Singapore with the best hosts that we could have wished was really worthy! Back home, we met Glamis mother, Jessie, who welcomed us as if she was our own mum! We were offered Glamis room, a big room with its own bathroom inside, and the whole family took care of us from the first moment until we said goodbye to each other four days later. 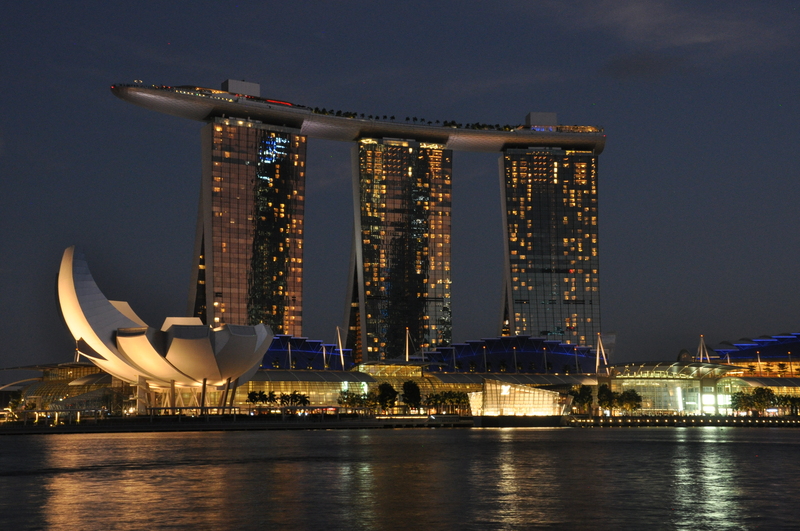 To be honest, our main reason to visit Singapore, apart for getting to know Glamis family and meeting Nicole again, was to rest and taking a break from our tiring travelling, which had been non-stop for more than 3 full months at that time! We did not want to wake up early and we didn’t mind at all spending time at home with the Koh family instead of going crazy with shopping and sightseeing. The mornings were wonderful! We slept until we couldn’t sleep more and when we woke up, the sweet Jessie had brought us Chinese breakfast and coffee in a plastic bag with a straw!!! I really loved it!!! Today we were really exhausted and we rested at home most of the morning and afternoon. 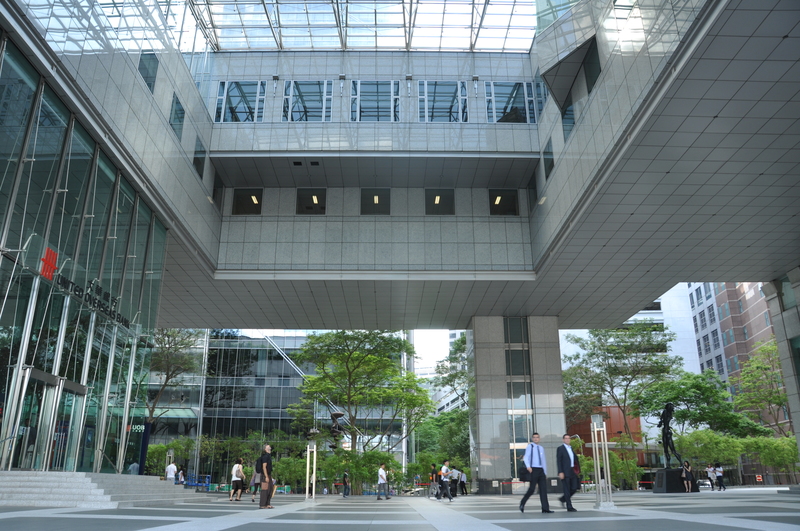 Late in the afternoon, we went to Bugis, the Malay district of the city, in order to buy some cheap clothes, something that Bugis is known for. 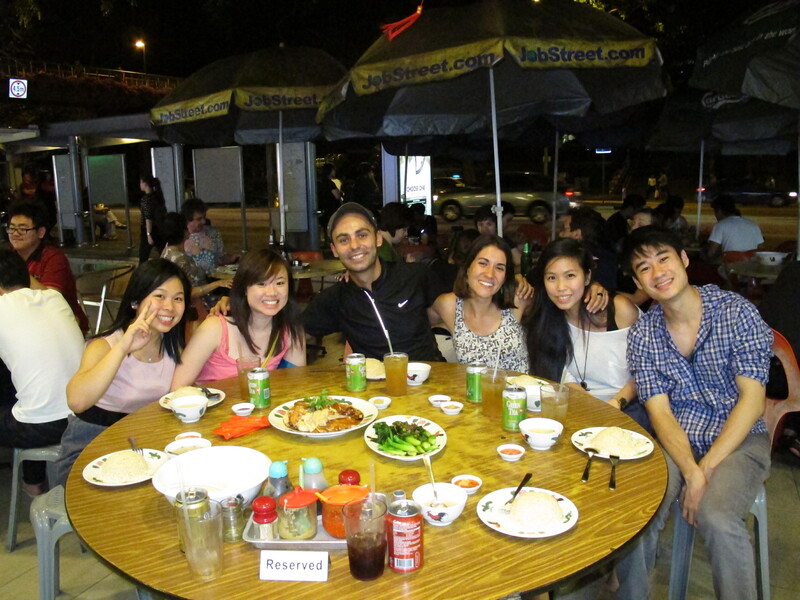 In the evening, we met Kelin, Lucinda, Nicole and Adam and we went to have another typical Singaporean meal: chicken rice in an open-air restaurant (did I already mention that the temperature is always fantastic in Singapore?) and durian ice-cream for dessert. Our Singaporean friends insisted in seeing our faces while we tried the ice-cream of this stinky fruit! We had a really nice time and there is even a video of Iván while he tries it! 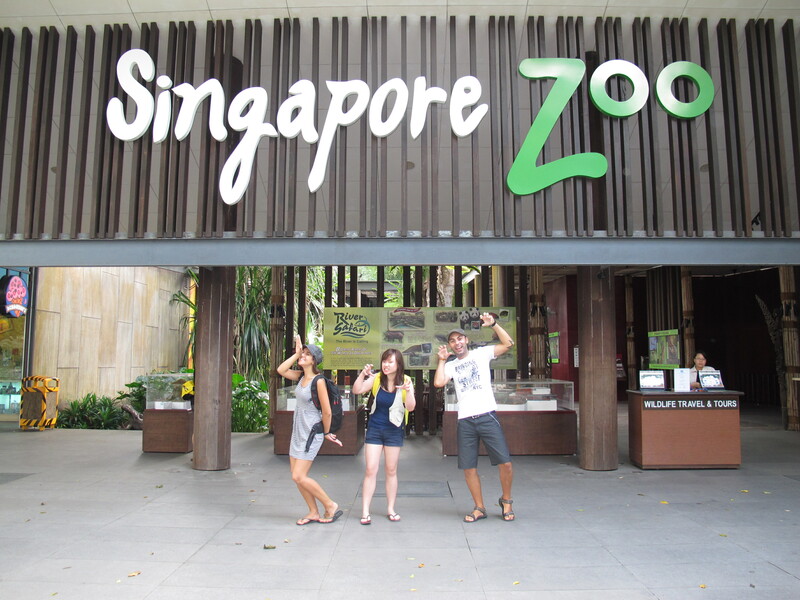 Today we woke up a bit earlier because the plan was to visit one of the main attractions of Singapore: the Zoo! Which animals are we imitating? Kelin didn’t have to go to school that day so she could joined us, something which we were really glad for! She was extremely kind with us and she always tried to plan her schedules at school in order to have more time with us. 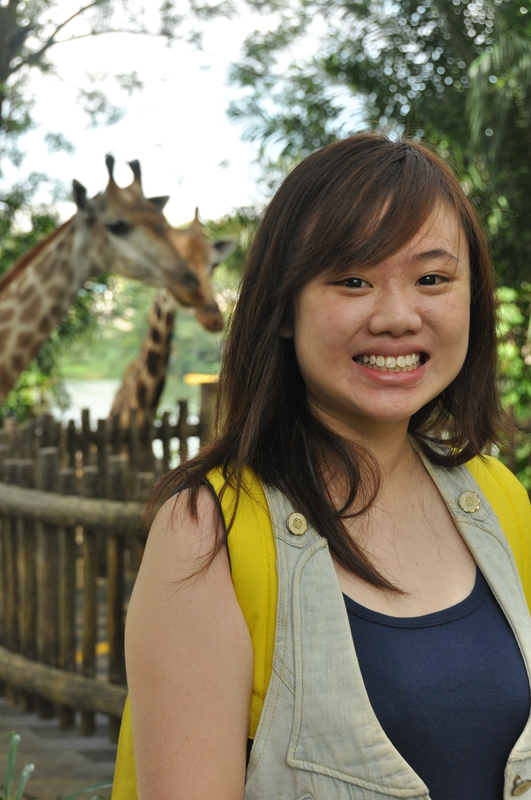 Kelin in the Singapore Zoo with her favourite animals, the giraffes! 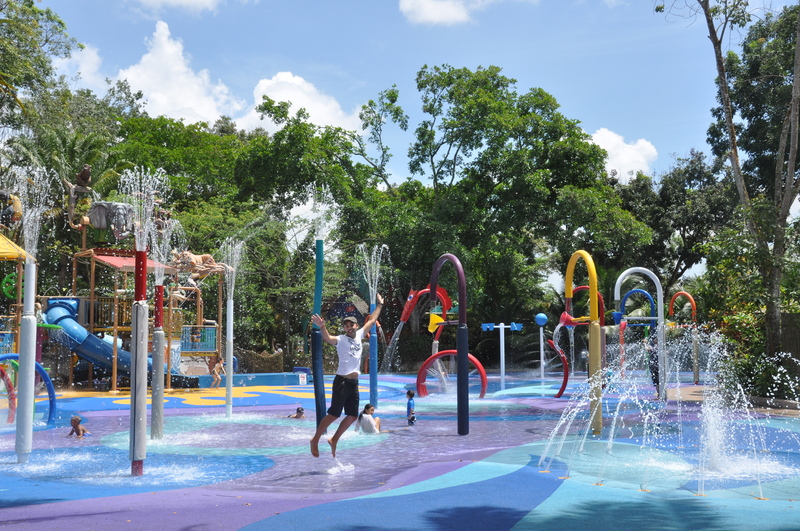 The Singapore Zoo is quite impressive because of its size and the amount of species of animals that it houses (28 hectares and more than 300 species), but also because of the facilities, where the exhibits have boundaries conceived to look as natural as possible. Besides, the Zoo has gained many Awards because of its rescue and conservation efforts to protect wildlife. The Zoo is also involved in plenty educational projects and it offers daily shows with several species of animals. We attended the elephant show and it was great! 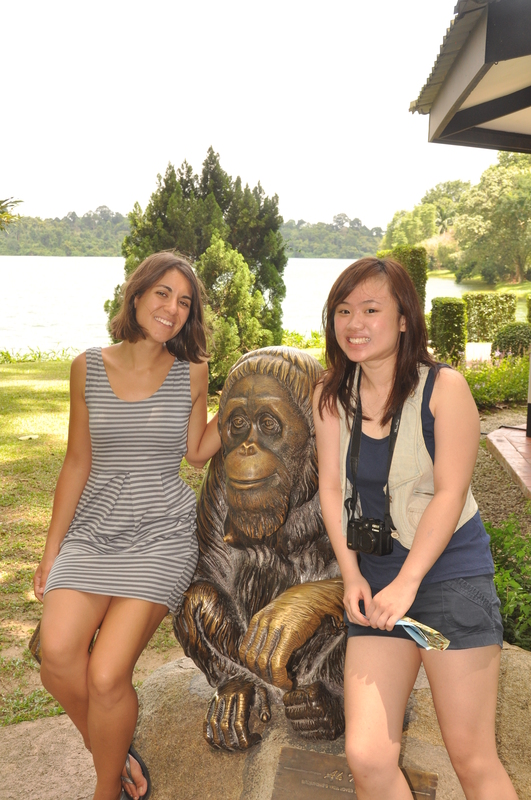 But the flagship of the Zoo is the orangutan community, the largest captive colony of orangutans in the World. The orangutans in the Singapore Zoo have a large open area with climbing platforms where they can develop their climbing skills. But watch out! You have to be really careful when you go under the ropes where the orangutans hang if you do not want to get a sudden downpour of yellow rain! 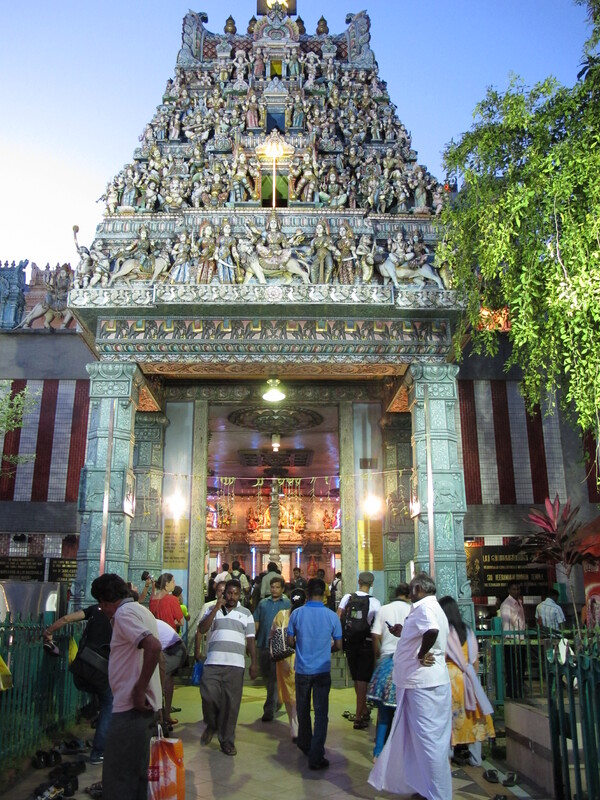 In the evening, we met Lucinda and the four of us went to Little India. 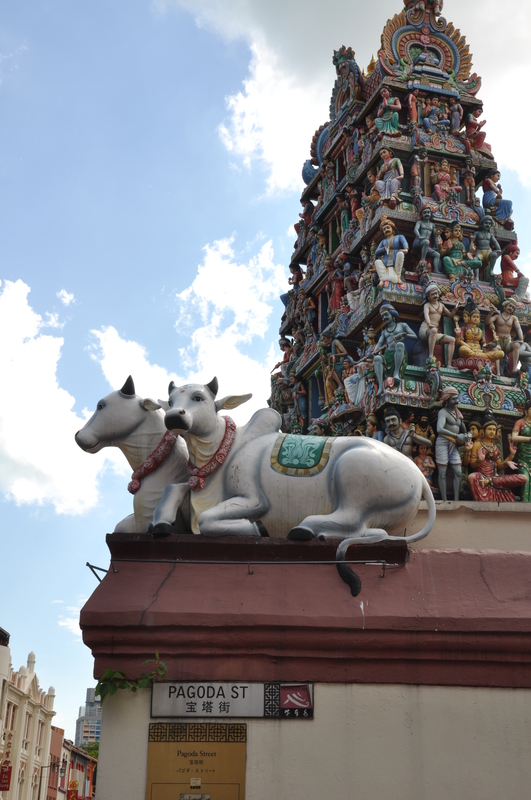 Little India is the area of Singapore where the Indian community lives and since we got out of the metro we felt like we had been transported to India itself! The colors, the smells of the spices, the bazars…it really felt like being in old Delhi! 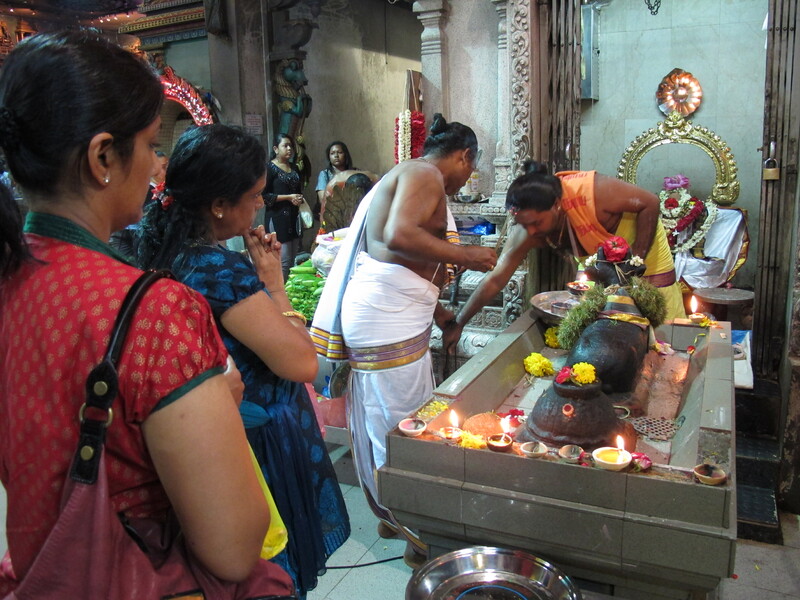 This feeling intensified when we visited the main temple of the Indian district, Veeramakaliamman Temple, which was full of Hindu individuals doing their evening prayers and making their offerings. After dinner at a local Indian restaurant (but cleaner and serving food not as spicy as the real India, I must say), Kelin, Lucinda and us when to have a “bubble tea”, a type of tea typical of Taiwan which is very popular in Singapore, and that our friends really wanted us to try! 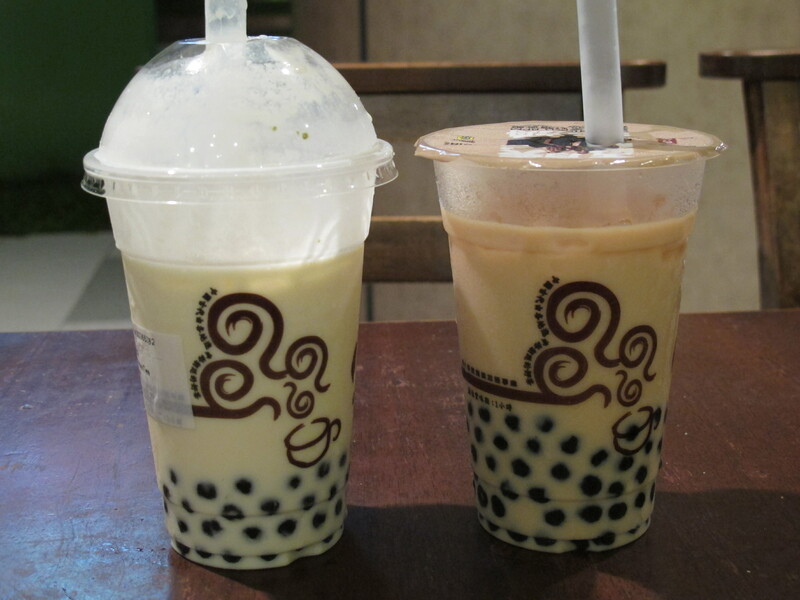 Bubble tea contains small chewy tapioca balls commonly called “pearls” which one should chew while drinking the tea. I really liked it, but Iván thought that it was a bit heavy and “tiring to drink/chew”, especially after the dinner. No matter what, we laughed a lot this evening when we taught each other Spanish and Chinese songs while drinking bubble tea. In fact, one of the best moments of the day was watching Kelin and Lucinda singing “una lágrima cayó en la arena”, a really typical Spanish song. We had tremendous fun! Once at home, we sang the Chinese song that we had learnt from Kelin and Lucinda to Kelin’s parents, uncle and brother, and they were really excited and impressed because apparently we pronounced with a good Chinese accent! Amazing! As a last anecdote of the day, I would like to tell this story. That day it was my grandfather’s birthday (he became 85 years old) and when I called him by Skype in the evening, Kelin and Lucinda wished him happy birthday in Spanish and Kelin’s parents “talked to him” with me as a translator. They thought that he was really nice and my grandpa invited them to Madrid to cook them some Spanish food. When Spencer invited him to Singapore, then he replied that he could only go if he travelled by donkey, since he is afraid of flying and he has never done it. The whole family laughed at the joke, my grandpa has a great sense of humour! 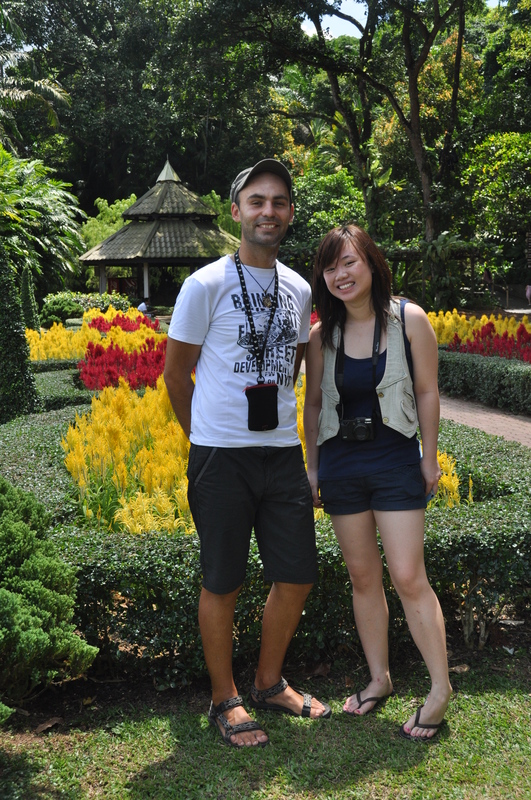 This was our last full day in Singapore and we wanted to make the most out of it! Spencer always tried to give us a lift everywhere in his taxi and this morning, besides helping us to buy the plane tickets to Indonesia, he took us on his taxi gave us a ride around the center of the city. 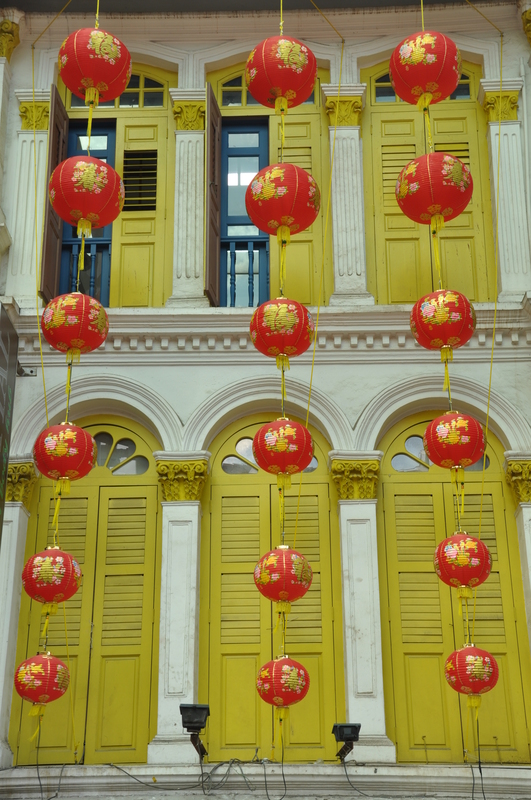 After having a delicious lunch together with him at the Maxwell Food Center in Chinatown, he left to work and Iván and I dedicated the rest of the day to do sightseeing around Singapore. 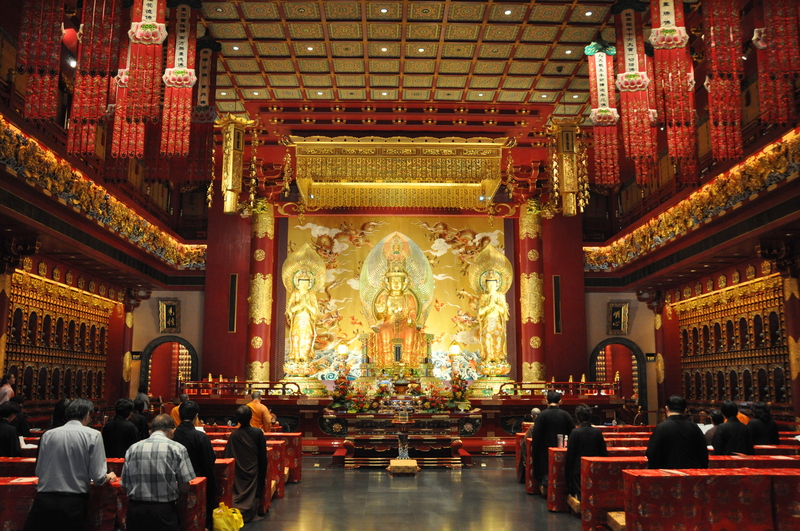 We started in Chinatown and visited the most famous temple, the Buddha Tooth Relic Temple, the streets with colonial buildings in pastel colors and the Hindu temple of Sri Mariamman. 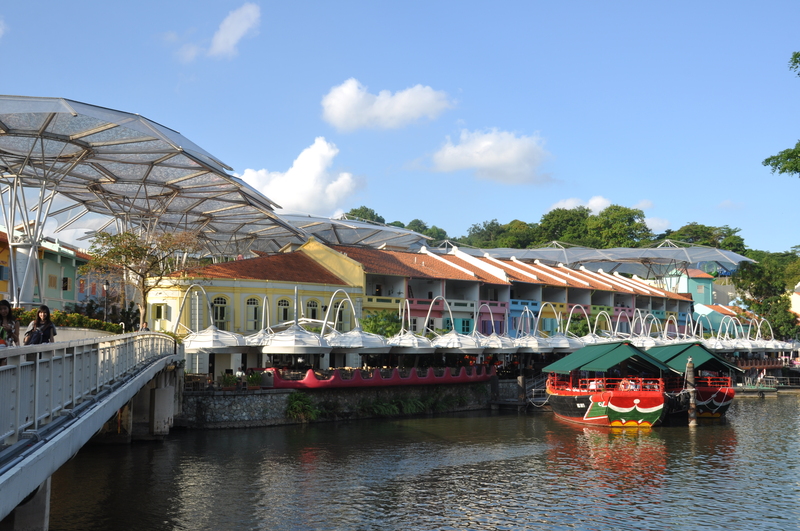 Then we headed to the financial district and walked around Boat Quay towards Clarke Quay. 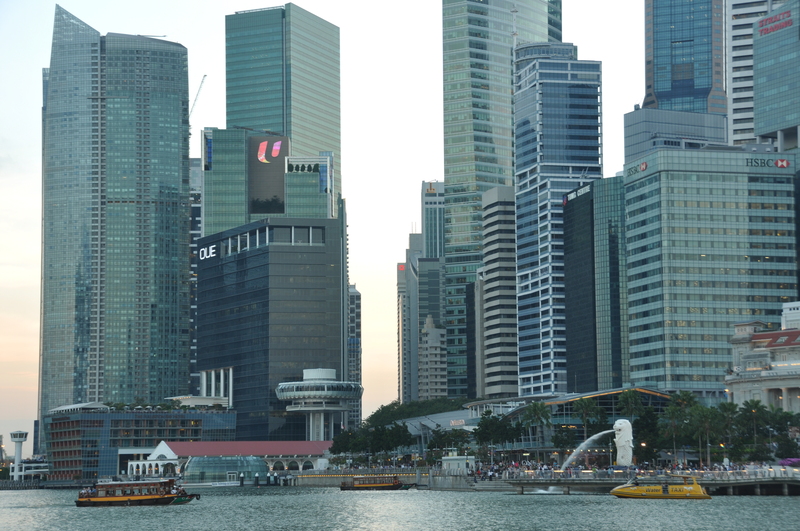 After trying the typical and weird ice-cream sandwich, we went to Esplanade to see the sunset with views of the Singaporean skyline. Just by chance, a free open-air classic concert was starting at that moment and we lived a very romantic moment while listening to classical music with such fantastic views! 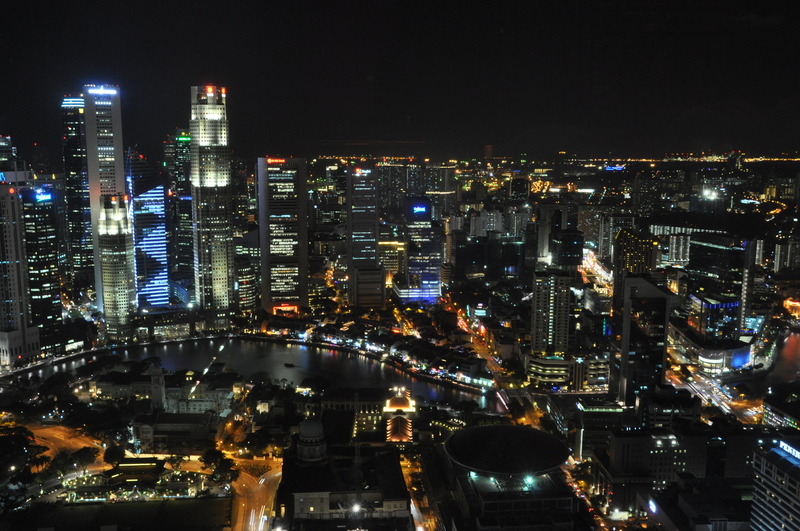 After sunset, we went up the Swissotel to enjoy the views from the top floor bar and then visited the famous Raffles Hotel. Finally, we met Kelin and Spencer and went to have dinner with them: delicious rice pudding and other Chinese specialties! 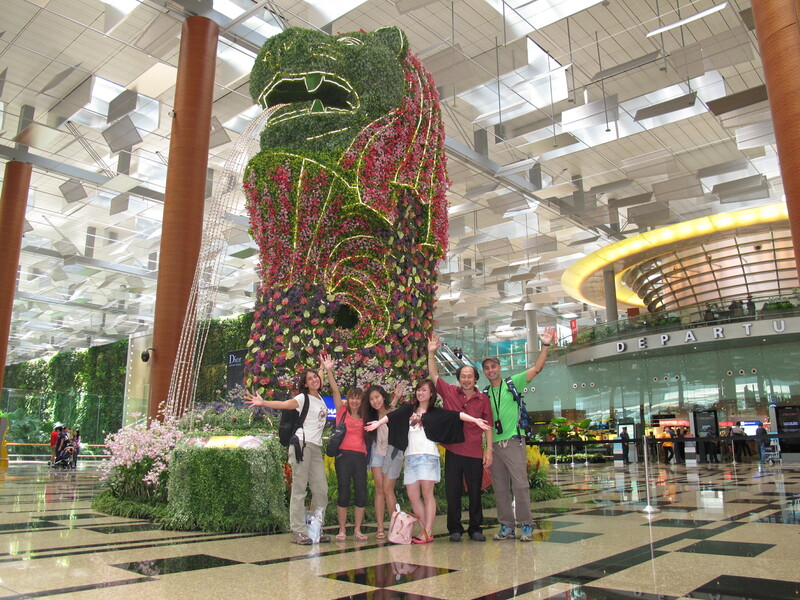 Today we were leaving Singapore and started our Indonesia trip. We felt excited about going to Indonesia, but at the same time, we were sad for leaving the Koh family, whom with we felt truly like at home. As always, they were extremely nice with us, helping us packing and in the post office, where we had to send a package home. Then, they all drove us to the airport –even the mum, Jessie, who doesn’t like going out so much, came to say good bye to us- and insisted on having lunch with us before we left. Nicole also met us at the airport and for lunch, even though she had been and still was quite sick the past days. We hope that we can pay back all this attentiveness and generosity and we take advantage of this chance to officially invite the Koh family to our home in Copenhagen. Thanks once more wonderful people, we will never forget these fantastic days in Singapore with the best hosts that we could have ever asked for!! Bye bye wonderful Koh family!!!! And thanks for everything!!! !